In celebration of the bicentennial of Louis Braille's birthday in 1809, the United States Mint has released for sale the Louis Braille Commemorative Silver Dollar Proof. These coins have the unique position of being the first minted by the United States to include readable Braille, a system used by the blind and visually impaired to read and write. Born in France, Louis Braille lost the sight in his left eye at the age of 3 from an accident with a tool in his father's workshop. Infection spread to his right eye, and by the age of 4 Braille was completely blind. Still eager to learn, Braille attended the Royal Institute for Blind Children in Paris beginning at age 10, making him the youngest student there. While at the Institute, Braille received his education mostly by listening to the instructors, but he also read books that contained large raised letters. Not content with this, and improving on a method shown to him by Charles Barbier de la Serre, a captain in Napoleon's army, Braille invented a system where all the letters in the alphabet could be represented by a maximum of 6 dots in 2 columns. This system is still used today by those with sight impairments. The commemorative coin was minted in accordance with the Louis Braille Bicentennial Braille Literacy Commemorative Coin Act. A Louis Braille Bicentennial Silver Dollar Uncirculated version is also available. Update: 2010 saw four new commemorative coins issued by the US Mint, one of which was the Disabled Veterans Proof Silver Dollar. 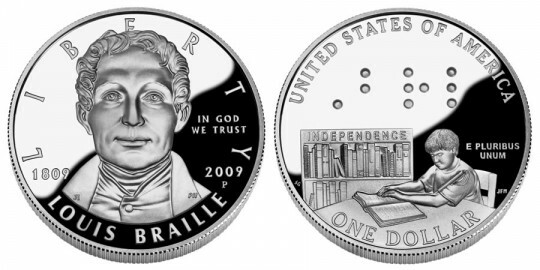 The obverse designed by Joel Iskowitz and sculpted by Phebe Hemphill includes a portrait of Braille, and the words "LIBERTY", "IN GOD WE TRUST", "LOUIS BRAILLE", "1809", "2009" and the "P" mintmark.. The reverse shows a child reading a book in Braille. The word "Braille" (abbreviated Brl in Braille code) is depicted in the upper field, and the word "INDEPENDANCE" is shown on a bookcase behind the child. Also included are the inscriptions "UNITED STATES OF AMERICA", "ONE DOLLAR" and "E PLURIBUS UNUM". It was designed by Susan Gamble and sculpted by Joseph Menna.